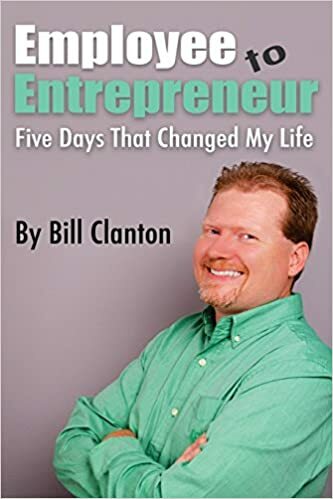 Employee to Entrepreneur: Five Days That Changed My Life, is a documentation of Bill Clanton’s journey from being an employee to now being an entrepreneur. Through this book, Bill shares the good and the bad of this transition including life struggles, client/customer relations, and personal growth. The five days that changed Bill Clanton’s life began as a simple five-day vacation. However, through an almost child-like game he fabricated a life changing frame of mind. This book is a quick read that gets down to the point of the story at hand and will inspire anyone who has considered stepping away from the employee mentality. This book is not meant to be a guide as to how to quit your job, this is book is just one entrepreneur sharing his story. Colorful Coast: Pirate Edition, incorporates some images and themes that have come to be associated with the pirate life. From the Jolly Roger to Pirate Ships, there is a page for everyone in this fun unique coloring book. 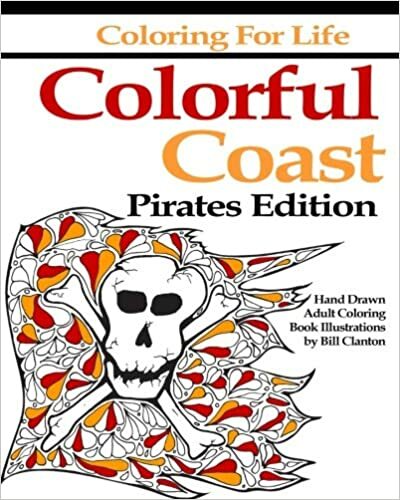 At its core, Colorful Coast is an adult coloring book or coloring book for grown-ups that captures the thrill of being a pirate and puts it on the pages for you to color. Color fun mosaics and mandalas as well as sketched art, abstract pirate images, and underwater sea life that will find you all the way down in Davy Jones’ locker. This book is the perfect addition to any colorists library. This is a Jersey Shore themed adult coloring book! 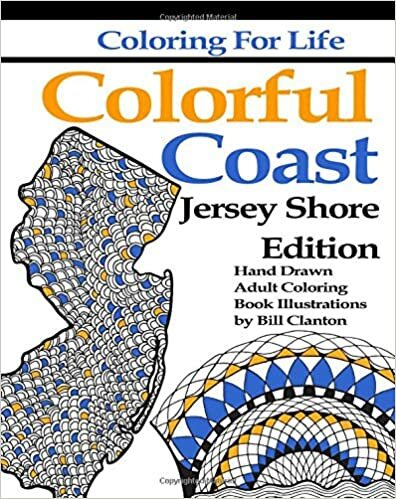 Colorful Coast: Jersey Shore Edition, incorporates some images and themes from the resort regions of the New Jersey Shore. From Sandy Hook to Cape May there is a page for everyone in this fun unique coloring book. 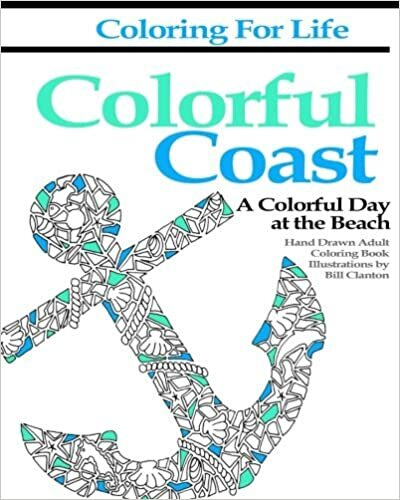 At its core, Colorful Coast is an adult coloring book or coloring book for grown ups that captures the excitement of a day at the beach and puts it on the pages for you to color. Color fun mosaics and mandalas as well as sketched art, abstract nautical images, and underwater sea life. This book is the perfect companion for your next beach day under the umbrella, a day out on the boat, or just letting the stresses of the day melt away as you dream of a day at the beach. This is a bonus edition of the original “Colorful Coast” coloring book. This new edition features 44 unique coloring pages by Author and Illustrator Bill Clanton. Colorful Coast, a unique hand drawn adult coloring book with a picture for that everyone will actually want to color. Colorful Coast: A Colorful Day at the Beach, incorporates some images and themes from the east coastal regions of the USA. 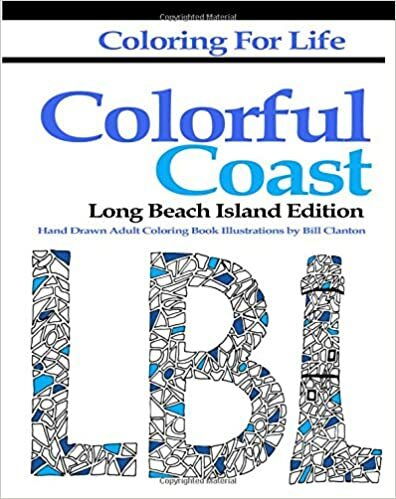 At its core, Colorful Coast is an adult coloring book or coloring book for grown ups that captures the excitement of a day at the beach and puts it on the pages for you to color. Color fun mosaics and mandalas as well as sketched art, abstract nautical images, and underwater sea life. This book is the perfect companion for your next beach day under the umbrella, a day out on the boat, or just letting the stresses of the day melt away as you dream of a day at the beach. The Colorful Coast: Cape May, NJ Edition incorporates some images and themes from the Cape May resort region of New Jersey. At its core, Colorful Coast is an adult coloring book or coloring book for grown-ups that captures the excitement of a day at the beach and puts it on the pages for you to color. Color fun mosaics and mandalas as well as sketched art, abstract nautical images, and underwater sea life. This book is the perfect companion for your next beach day under the umbrella, a day out on the boat, or just letting the stresses of the day melt away as you dream of a day at the beach. Also find Victorian architecture and other images that remind you of a visit to beautiful Cape May, NJ. Click Here to Buy It! The Colorful Coast: Long Beach Island Edition incorporates some images and themes from the Long Beach Island region of New Jersey. 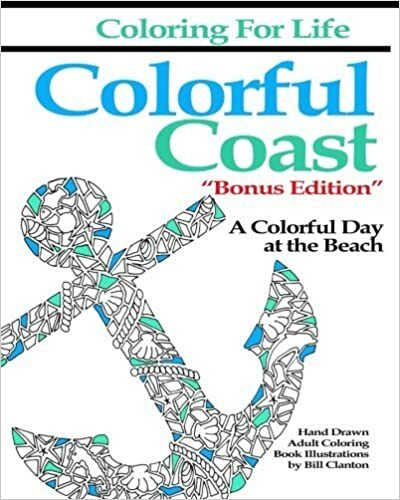 At its core, Colorful Coast is an adult coloring book or coloring book for grownups that captures the excitement of a day at the beach and puts it on the pages for you to color. Color fun mosaics and mandalas as well as sketched art, abstract nautical images, and underwater sea life. This book is the perfect companion for your next beach day under the umbrella, a day out on the boat, or just letting the stresses of the day melt away as you dream of a day at the beach. Click Here to Buy It! Colorful Coast: A Colorful Day at the Beach, incorporates some images and themes from the east coastal regions of the USA. At its core, Colorful Coast is an adult coloring book or coloring book for grown ups that captures the excitement of a day at the beach and puts it on the pages for you to color. Color fun mosaics and mandalas as well as sketched art, abstract nautical images, and underwater sea life. This book is the perfect companion for your next beach day under the umbrella, a day out on the boat, or just letting the stresses of the day melt away as you dream of a day at the beach. Click Here to Buy It! 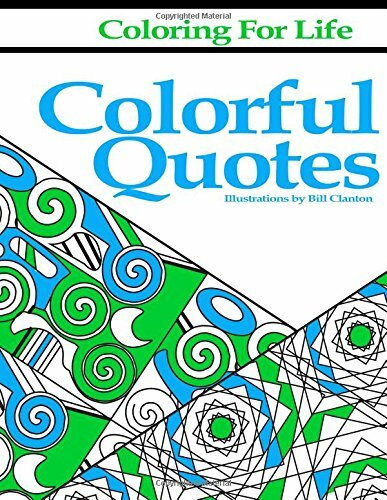 “Colorful Quotes” is an adult coloring book that brings the relaxation of coloring together with the inspirational words of some of history’s most influential people. When you find yourself pushed down by today’s hectic world, let “Colorful Quotes” lift you up and give you an escape. Click Here to Buy It! In this book you’ll find fun patterns and words that you’ll love to color. Whether you use pencils or gel pens, Colorful Quotes will let you create artwork to decorate your home, and inspire those who view it. Click Here to Buy It! Coloring for Life: Not So Sweary! We’ve all had those moments where a full force vulgar curse word is necessary, yet found to be socially unacceptable. So here is an adult coloring book for those times when an alternative curse word is needed. In this book find fun pages to color that will say what needs to be said, but with a purely “PG” rating. So pour yourself a glass of Sugar Honey Iced Tea and Shut Your Pie Hole because this book needs to be colored. Get it here. 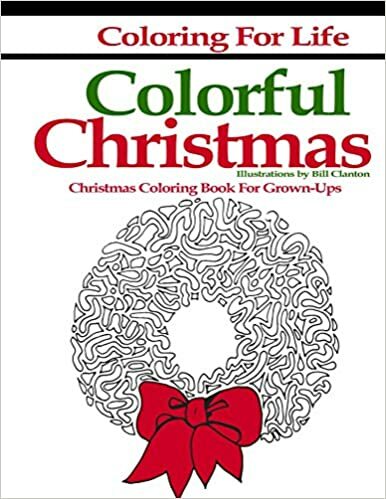 Coloring for Life: Colorful Christmas is a coloring book for grownups or adult coloring book that features some great Christmas patterns and designs. This book is the second book in the Coloring for Life series, created by Bill Clanton. In Colorful Christmas let the spirit of the season take you back to magical the Christmas of your childhood. Snowflakes, Snowmen, Christmas Lights, abstract ornaments, Christmas trees, and more are just waiting for your creative touch to bring them to life. So this Holiday Season, make your Christmas Colorful, with Colorful Christmas from Coloring for Life. Whether you spell it “coloring” or “colouring”, you are sure to find this book a pleasure to color. Click Here to Buy It! Have you been thinking about creating an adult coloring book or coloring book for grown-ups? Have you created great artwork, but need some guidance as to how to start? This book is a great starting point for anyone looking to get into the world of coloring book publishing. The methods in this book can be applied with little experience and minimal expense. 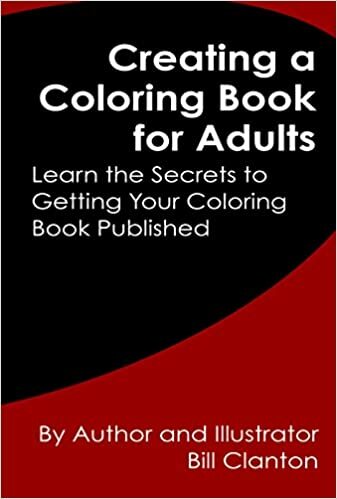 In this book you will also find some hidden or less obvious tricks and suggestions that will save you time and frustration when publishing your first coloring book for grown-ups. You can follow the coloring book trend too! Learn how to have your book published in paperback and on Kindle. There are also details on how you can get your book featured in traditional brick and mortar book stores and boutiques. From pencil sketches to digital downloads, this book covers it all. Click Here to Buy It!